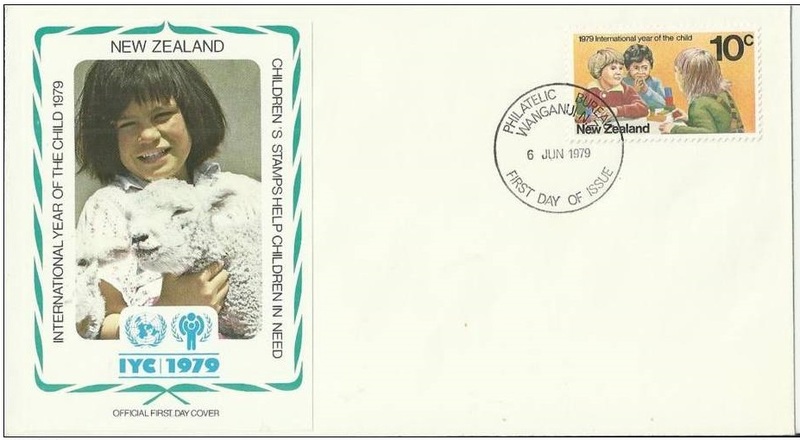 Virtual New Zealand Stamps: 1979 Other Events. 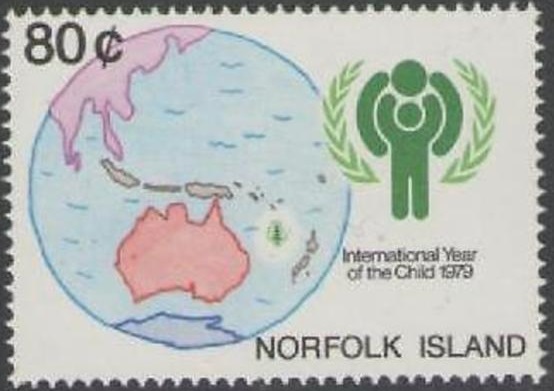 1979 United Nations Year Of The Child. 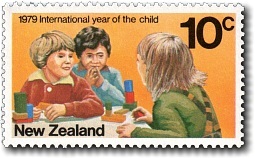 10c - Children At Playschool. 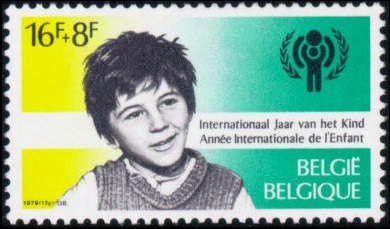 1979 was designated the International Year of the Child by the United Nations in order to focus the attention of all countries on the special needs of children, and to stimulate the sharing of international experience and resources to promote the well being of children everywhere. 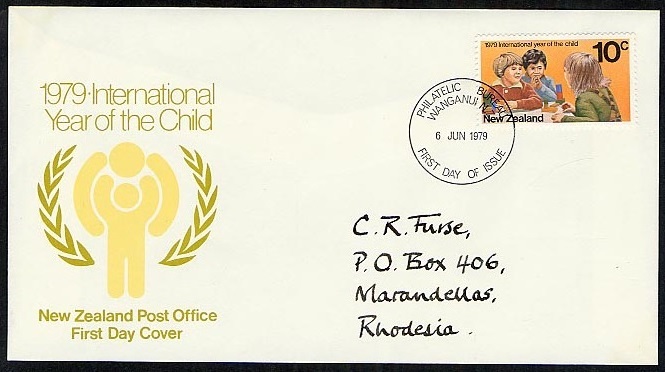 This cover shows the 1979 International Year of the Child emblem. On this second cover the emblem has been replaced with this lovely photo of a young girl holding a baby lamb. 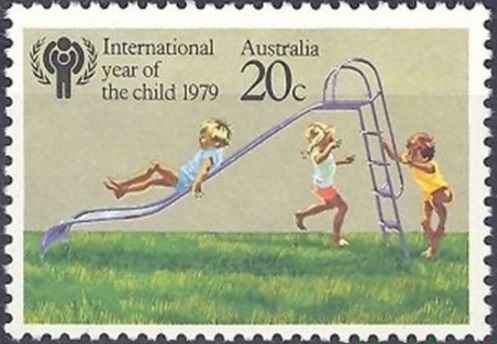 The 1979 International Year of the Child was celebrated in many countries by the issuing of postage stamps. A quick search revealed many of them. Below is a small sample. 1979 25th Commonwealth Parliamentary Conference in Wellington. 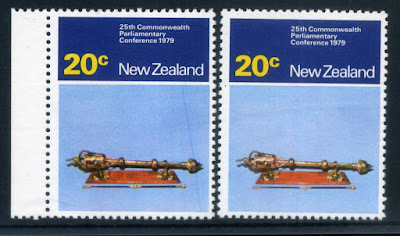 It was the third time New Zealand had played host to this conference, the previous occasions were in 1950 and 1965, and the second time New Zealand stamps had commemorated such an event. 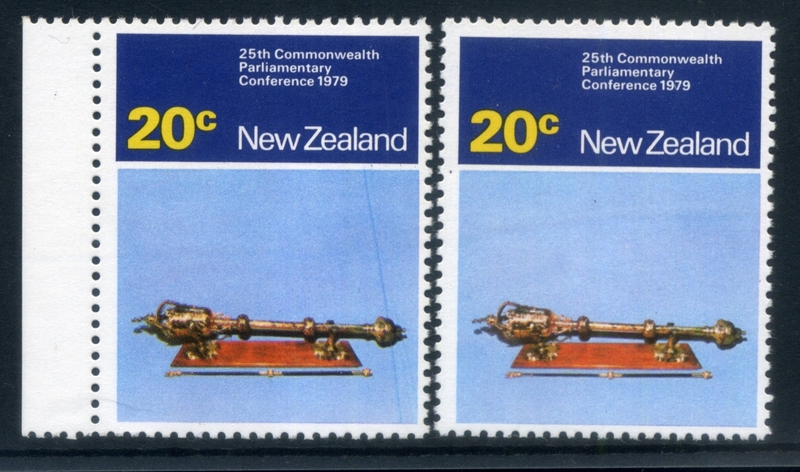 When the 25th Commonwealth Parliamentary Conference opened in Wellington in November 1979, the New Zealand Post Office released a set of three stamps to commemorate the event. 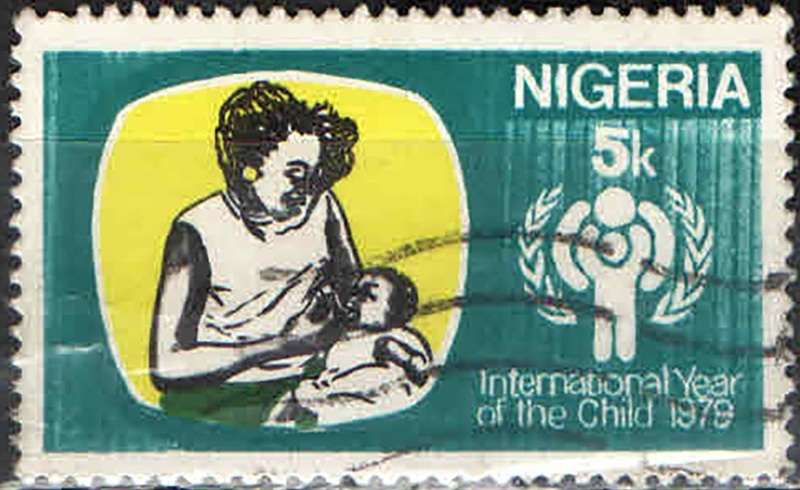 1965 Parliamentary Conference. 14c - Chamber of the New Zealand House of Representatives. Often called the Debating Chamber, this room is where Parliament members meet to debate the various acts being considered. 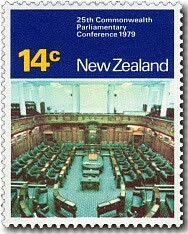 It is the part of parliament most likely seen by the public, either on the news media or from the public gallery on the floor above. In this view the Government, currently National in 2016, occupy the seats to the right while the opposition parties are on the left stretching around to the seats in the foreground. 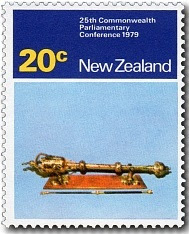 In the center is the table where the Mace and Black Rod, see in the stamp below, would sit when Parliament is in session. The speaker, the member who controls and keep order in the house, sits in the high seat at the very far end of the room. 20c - Mace and Black Rod / Parliamentary Symbols. At the beginning of each session these symbols are carried in and placed on the centre table scene in the view on the 14c stamp. 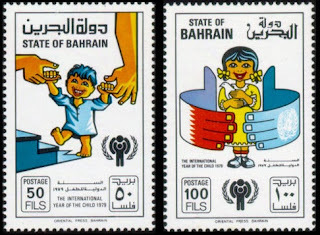 These symbols remain in place while Parliament is in session and then when a particular session ends they are removed for safe keeping until being recalled for the next session of Parliament. 30c - Mural in the 'Beehive' Foyer, Parliament. Often special functions are held in this area with people sitting at tables set up for the occasion. 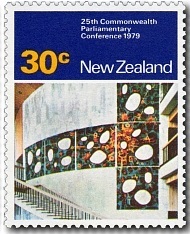 The 'Beehive' is the building, next to Parliament Building, where many of the members have their offices. The Prime Minister and cabinet occupy the top floors. 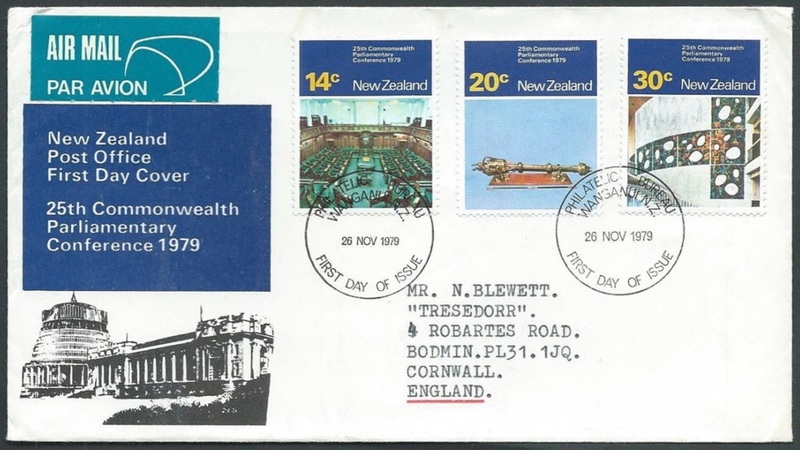 For more on the buildings of Parliament see our collection Parliament Buildings. 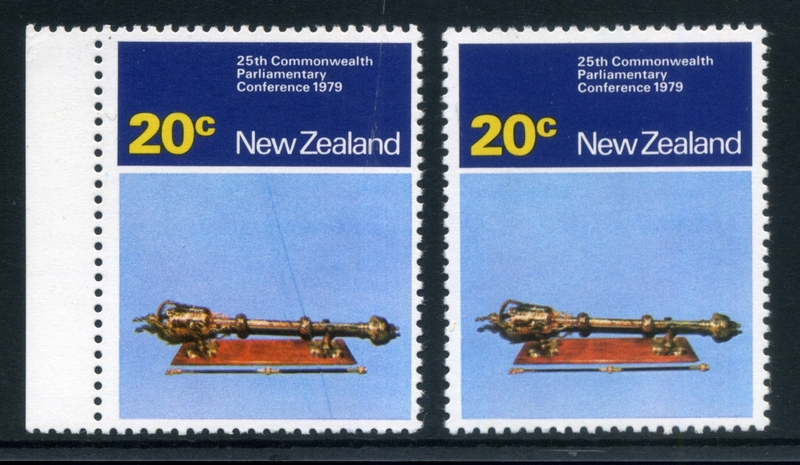 Above and below:- 1979 20c Parliamentary Conference - 2 examples of mint single stamps (left stamps) with major blue extra line through central design. 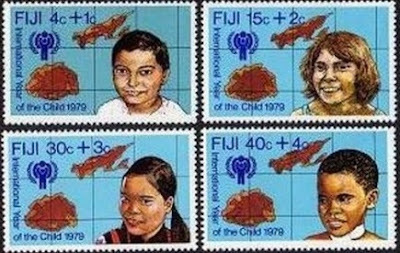 Notice how the line has shifted which leads me to the conclusion that this was caused by some foreign object on the surface of the dark blue printing plate. 1981 Anniversaries / Family Life. 2016 A Journey Through Middle-earth. 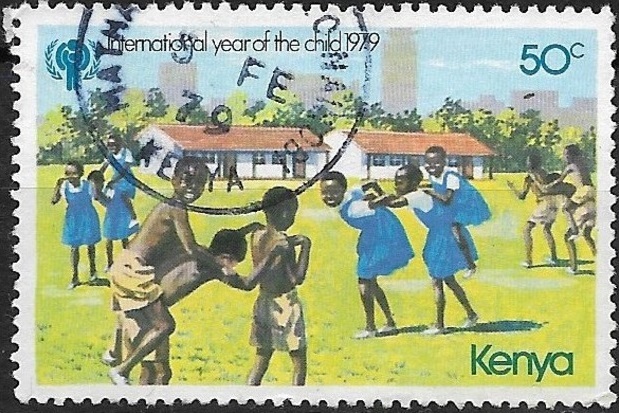 1979 Statesmen of the 19th Century.